Do you feel a little like saying “Bah Humbug!,” at this stressful time of year? Well, get yourself along to the Edinburgh Festival Theatre to see this sparkling, glamorous, 6 star Broadway-style show. You’ll come out singing and skipping down the street full of festive spirit in your heart. Irving Berlin’s “White Christmas” is a stage version of the classic 1954 film starring Bing Crosby, Danny Kaye and Rosemary Clooney. It seems extraordinary that the Musical did not transfer from screen to stage until 2004, since when it’s been performed from Broadway to Australia and around the UK. This multi-million pound production features a full scale orchestra, ambitious sets, stunning costumes and and top notch cast led by Steven Houghton, Wendi Peters and Graham Cole. The story begins in 1944 at an American Army base in Europe, where Bob Wallace, Phil Davis and fellow soldiers are putting on a Christmas show. General Waverly addresses the troops, offering them the hope that the War may be over within another year. Fast forward to 1954 and Wallace and Davis are a song and dance double act, touring Vaudeville Theatres. The narrative takes us on an emotional journey after the boys meet Betty and Judy, a musical duo, all seeking both stage success and true love. With amazing quick changing scenes from train to Country Inn, New York piano bar to a Vermont Barn, it’s a charming tale of loyal Army friendships and sweet romance against a 1950s vintage period setting. Even if you think you don’t know the songbook of Irving Berlin, here are some familiar songs, (Sisters, How Deep is the Ocean, I love a Piano), flowing in and out of the dramatic plot. Steven Houghton and Jayde Westaby are simply terrific as Bob and Judy, as are Wendi Peters and Graham Cole as Martha and Henry Waverly: this is a flawless show with polished performances from the entire ensemble. A gold star to young Emily Balderston as the General’s feisty grand-daughter Susan. 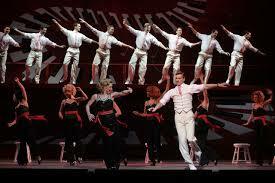 The choreography by Randy Skinner is simply breathtaking, slick poetry in motion. 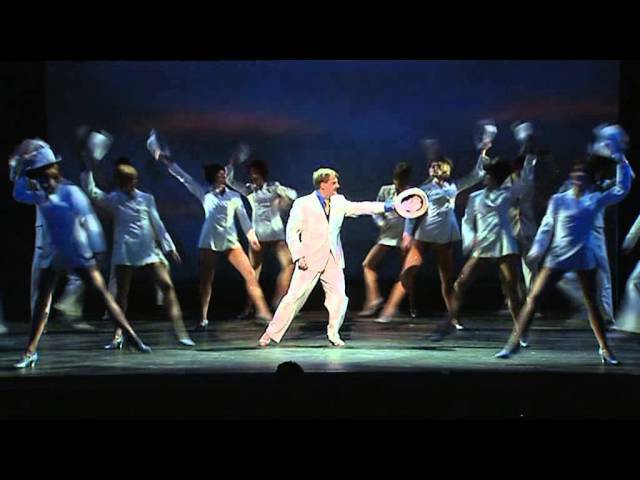 Highlights include the stunning routine for Blue Skies, with the company dressed in white suits and fedora hats, tap dancing their way across the stage in perfect precision. The finale – a Winter Wonderland scene is like a giant, glittering Christmas card for the classic Festive song, “I’m Dreaming of a White Christmas.” Sentimental, romantic, heart-warming. This show is in two words, Pure Magic. 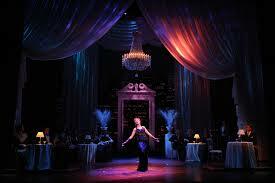 Edinburgh Festival Theatre, 29 November, 2013 – 4th January, 2014. Will Pickvance has become a well established pianist and comic entertainer around Edinburgh, from his well received Summerhall Fringe show 2013, “ Anatomy of the Piano”, to lunchtime concerts at St. Giles Cathedral. He describes himself as a Piano Player, enjoying the freedom of improvisation around diverse musical styles from Bach to Fats Waller. This may be true in England, where TV soap opera actors and long forgotten pop singers are unsuitably cast as Dames and Principal boys. In Scotland, the authentic Panto tradition continues as strong as ever. 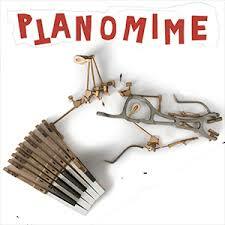 Staged in the ideal space of the Anatomy Lecture room at Summerhall, Pickvance sits at his upright piano, playing a prelude of lively tunes. The front of the piano has been removed so that we can watch the keys hammering away. The theatrical element is a quirky, fun Animation film (cleverly devised by Tim Vincent-Smith) on screen depicting a typical, romantic Fairy Tale. The pantomime characters are created from recycled wooden hammers, pieces of felt, keys, springs, nuts and screws taken from a friend’s piano saved from a house fire. With silent movie-style music, songs, silly jokes, Will is a one man band, as well as narrating from the rather roughly patched together pages of script on screen. (Who wrote this stuff?!! he asks half way through). We hiss and boo the baddy at suitable moments and invited to take part in the storytelling and sing a long. The 55 minute show is all very haphazard, under-rehearsed, when animation and script reading are occasionally out of sync. But there is no doubt that Mr Pickvance. ” the Piano Man”, has a rare talent as an entertainer, being able to hold the attention of an adult audience relating a fairytale, while we pretend to wear “magical” 3D glasses and sing silly songs. “Very, very bizarre!” said a man in the front row at the end. Yes, indeed. Zany, surreal, Pythonesque comic entertainment with unique wit and charm. 16 – 22 December, 2013. 8pm. With icy winds, rain, sleet and snow through the long British winter months, it’s vital to care for your complexion – just as you would protect your skin in the summer sun. Oriflame’s Ecollagen Skin Perfector is a magical serum to help restore your skin while you sleep. I have been trying this for over a week, applying a tiny amount under my usual night cream. The texture is light and luxurious with a gorgeous cooling effect as I smooth it evenly over the face. It’s amazing that just a tiny pea sized drop is sufficient, using the easy to use “pipette” inside the attractive green bottle. Nourishing and moisturising the deep skin layers overnight, it helps to stimulate collagen and therefore fine lines and wrinkles are reduced. I honestly saw a visible difference with a tighter, toned appearance. Oriflame Skin Perfector is indeed a unique and truly luxury anti-wrinkle serum, created to rejuvenate your skin for the “perfect” beauty sleep. So now, with youthful skin, you just need to enhance your complexion for all those festive season parties. I have also recently sampled Oriflame’s Giordani Gold, a most ingenious foundation in a mirrored Compact. I liked the white and gold oval shape, and inside is a neat half moon sponge applicator for the hard yet creamy and crumbly foundation-powder. The shade I tested was Natural Beige, which looked rather too dark for my very fair skin, but using a very little on the sponge, I spread this thinly over my face. I did not want to look as if I had applied too much fake tan!. I was surprised that it blended in pretty well, although a fairer shade would be more suitable for me. Yes, I agree. A most unusual combination of foundation and face powder which gave me a refreshed, smooth and youthful complexion. 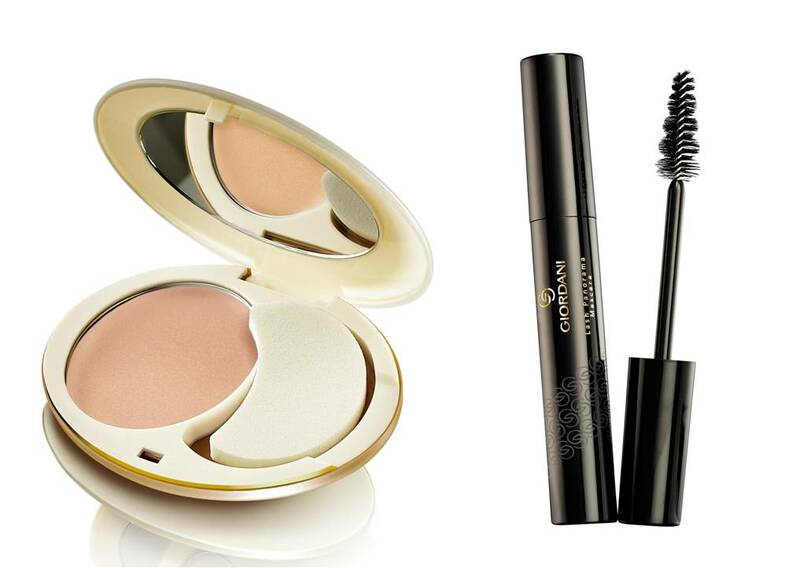 To complement the foundation compact, also try the new Giordani Gold Panorama Mascara, rather a lengthy name, but it offers glamour in an instant. I had expected luscious gold packaging, but it’s just black. However, the shape of the mascara brush is amazing – like a tiny Christmas tree. ! Applying the mascara, the lower thick “branches” reach the lashes at the outside of your eye, while the slimmer top end of the brush lightly touches the inner lashes. It’s a clever design following the natural curve of your eyelid, so that one easy stroke gives all your lashes a separate, evenly distributed, lengthened effect and neat curl. Perfect! Edinburgh Larder Bistro opened in the summer of 2012 with the serious aim to source and serve fresh, Scottish seasonal good food. It’s all about tradition too, foraging and harvesting produce in season then making pickles and preserves. 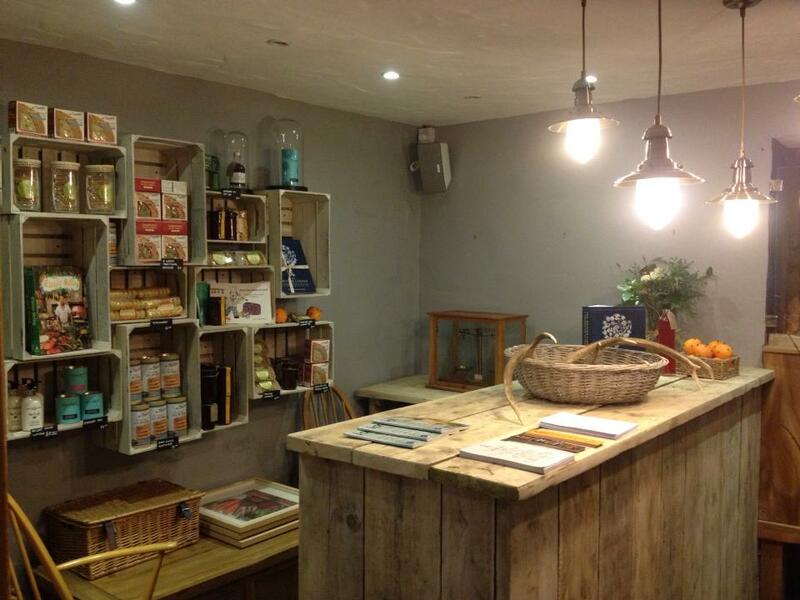 The Archipelago Artisan Bakery has just opened (November 2013), within the Bistro, selling various breads and yummy cakes. 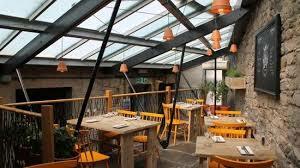 The quirky, cosy Basement bothy was previously the address of Bouzy Rouge and then Howies over recent years. Little has changed in terms of layout, with traditional flagstone floor, a row of booths in the front room, a square dining area and glass roofed conservatory. The furniture was renovated using old lobster creels, fruit crates and tables created from former scaffolding boards. The Larder Bistro is very proud of their specialist Artisan suppliers hand picked for quality – a shame they are not credited on the menu!. Check out the website and you’ll see that Venison comes from the Great Glen estates, beef and lamb from Peelham Farm, seafood from Welch fishmongers and Creelers’ Smokehouse, vegetables from Phantassie, cheese from St. Andrews Farmhouse Company, Beers from the Black Isle brewery, et al. On a chilly Friday in early December I visited for lunch with my friend Fiona. We were given the A la Carte menu, which is served for Lunch and Dinner. After studying all the (rather expensive) choices, we then noticed a tiny Asterisk symbol ** against a few dishes and down at the foot of the page, ** set menu lunch, £12 – 2 courses/ £15 – 3 courses. It’s obviously a closely guarded secret as our waitress did not let us know of this special good value offer. After due consideration, I selected the Pan fried smoked Rainbow Trout with wild mushrooms and mixed leaves. Fiona chose the Beetroot and Crowdie cheese salad. We also ordered bread to nibble while we waited, (extra charge). The thick slices of brown bread with soft herb butter was home made but rather heavy. And so to our two healthy Starters. My Smoked Trout was served warm, deliciously flaky, with sweet salad leaves and tiny wild mushrooms (woodland chanterelles I think), dotted around the plate. A very small portion, but exquisitely crafted with a unique earthy, smoky richness. Fiona meanwhile was enjoying her dish of Roasted shallot, caramelised beetroot and creamy cheese winter salad: “… really delicious with good flavours and textures, and just the right amount of dressing”. With our starters we sipped a refreshing, crisp and light Sicilian white wine, (Grillo Ca’ Di Ponti), one of the House wines (five white and red) all selected from Continental Europe. I am a Pescatarian with a passion for all seafood and shellfish. Therefore I was disappointed that two dishes on the menu combine fish with meat. Scallops with cured ham, Mussels with smoked bacon. Carnivores have a good choice elsewhere with Slow cooked Beef cheek and Braised Goose. Even the Chips are cooked in beef dripping (vegetarian chips available on request). Please leave fish, just fishy! And so on to the main courses. For my dining companion, Chestnut pie with barley and cabbage, while I chose the Purple Potato and Celeriac Terrine. I was intrigued by the Purple spuds which come from Carrolls Heritage Farm in Northumberland, “Potatoes like they used to taste”. The gravy was brought, unnoticed by us, several minutes later, with our side order of Vegetables (extra charge) – uninspiring boiled potatoes, sprouting broccoli and carrots. The range of Desserts are certainly imaginative, Christmas pudding parfait with hazelnut crumble and sheep milk ice-cream, Warm Pear and cobnut cake with marshmallow ice-cream, as well as Cheese platter with oatcakes. We were also offered to select a cake from the new Achipelago Bakery at the front of the Bistro. This was ideal to have with our coffee. The selection is superb and suitable for all diets – gluten free Brownies, Coffee and Walnut cake, Clementine and Almond Drizzle Loaf “Gorgeous!” said Fiona. The bakery was doing good take away business too with people calling in to buy bread, cakes and buns. While I enjoyed my superlative starter, as someone who eats out regularly on a professional basis, I was surprised at the small portions and prices (both vegetarian main courses around £14-£15) with an extra charge for bread/vegetables. There is no question about the quality, freshness, seasonality and specially sourced local produce at Edinburgh Larder Bistro which is an excellent name for a Restaurant which celebrates the finest of Scotland’s natural Larder, from farm, field and sea. Fans of the hilarious antics of TV comedienne Miranda Hart, are in for a treat as her new DVD is released in time for your post- Festive season diets and a keep fit regime for New Year. 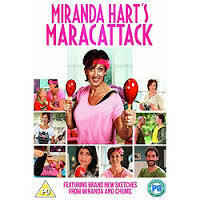 Miranda Hart’s Maracattack is an authentic fitness routine which skilfully combines exercise and Miranda’s zany and unique style of comedy. First, a medical health warning – this is a serious exercise programme in which you take part in your own home. Miranda Hart is the first to admit that she is rather too tall, slightly socially awkward, ungainly, often clumsy and loves to eat. She also cannot abide any form of exercise and the starting point in the DVD is a series of amusing sketches illustrating how physical fitness is not her favourite leisure activity. We observe her confronting a personal trainer at 6.30am, visiting a gym (with snacks to keep her going), jogging in a park and throwing herself into an Army Boot camp. Having given up on all this as well as Yoga and Zumba classes she has decided to devise her own unconventional fitness regime involving shaking a pair of Maracas to classic pop tunes with intensive floor exercises. “Get off your sofa!” Miranda screams at the viewer to get the session started. Actually, I simply sat on my sofa watching the fun and games (but may try it properly later…). The setting is Miranda’s flat, all pretty pink and turquoise decor, with a fruit bowl on the coffee table. Her preferred fruit? A large mountain of Chocolate Oranges!. Before we can start getting fit, we need a pair of Maracas. Enter Kirstie Alsopp (described as a cross between the Queen and a Blue Peter presenter), who attempts to help Miranda create home made “papier mache and balloon” Maracas – with hilarious slapstick results. Another guest is Patricia Hodge who tries in vain to teach her the principles of healthy nutrition. Miranda has some crazy ideas about food which does not count – eating on a plane (too high up), birthday cake (calorie free as it’s someone else’s cake), and snacking while cooking (but it’s a pre-meal!). The Exercise programme then begins in earnest with the professional assistance of fitness expert Amelia Watts (size zero, toned and healthy). Towering over her is Miranda, dressed in a pink T shirt with the slogan Chic, Chic, Chic across her ample bosom. Keeping fit in the company of Miranda will certainly make you laugh – which is exactly her point. It’s all about “funness”. Cue Abba music and start shaking those Maracas for an energetic cardio session to work those legs and bums!. “Instead of looking at it as an exercise DVD, I took more notice of the music – I was still exercising but having a laugh at the same time. As for making me fitter I actually lost 2lbs after making no changes except doing the whole DVD twice.” Beach Babe, Amazon review. 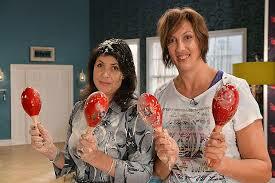 Miranda Hart Maracattack. BBC Worldwide Ltd. DVD rrp £ 19.99. “Of all the gin joints in all the towns in all the world, she walks into mine”. Eating and drinking out in Edinburgh has just got oh so more sophisticated with the opening of the fabulous Twenty Princes Street Grill & Smokehouse (exquisite cuisine), and next door the cool and classy Cocktail Bar, Juniper. 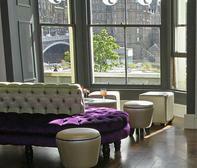 With window views over Princes Street Gardens up to the Castle, the décor is all about glamour. Relax on a funky purple sofa or comfy wing armchair and indulge your taste buds with some seriously wicked alcoholic concoctions. Given its name, Juniper, this is a Gin Joint but there’s more than a classic G and T on the drinks list. As the Festive season stars fizzing, the inventive Bar tenders here have been cooking up some tempting new colourful and culinary tipples. Being a lady with a daring streak, I selected the Russian Roulette, a deliciously refreshing blend of two Stolichnaya Vodkas, raspberry and vanilla, the spirit softened with St. Germain elderflower liqueur and lemon. It hit the spot in an instant and I loved the vodka soaked raspberry on top. My drinking buddy was also daring and asked the waiter to surprise him with something different. He was presented with a Wibble!. Plymouth Gin with Sloe Gin sharpened with lemon and pink grapefruit juice. Sipped slowly, this was voted first class. The Drinks List is divided into Edinburgh themes: The Old Town (Classics with a twist), such as the ingenious Full Scottish Breakfast – single malt whisky, with orange marmalade, flavoured with smoky bacon foam and dark toast. Perhaps not to be sampled first thing in the morning! Under New Town (modern classics), are the Russian Roulette and Wibble, as well as Wobble, a long drink of gin, vermouth, prosecco, and the Zombie, a hearty Caribbean Rum punch with tropical fruits. The section, West End, offers classy cocktails such as a modern take on the Sidecar, with Cognac, Cointreau, shaken not stirred with sweet plums and vanilla. To learn more about Cocktails you can book a Masterclass tasting session to watch a bartender create a few special tipples. If you prefer Bubbles, there’s a full page of Champagnes from Moet & Chandon by the glass to a Vintage bottle of Dom Perignon. (treat yourself!). And of course, a full range of spirits, beers and wines. Juniper also serves a selection of Street Food including Oysters, Chicken Wings, Lobster Sub –all rather posh to match the gorgeous surroundings. From January, Fondue Fridays will start the weekend off in style. Check out the Juniper website for all the Festive events over the Christmas and New Year party season. Juniper has been a hidden gem of a gin joint for a couple of months but now this is the place to be seen for the fashionable crowd around town. (But Sshh don’t tell everyone!). I can’t wait to return to try an Inkie Blinkie (tequila, lime, squid ink! ), and perhaps a Falldown, (gin, lemon, Moet). Circus is defined as “ a travelling company of acrobats, clowns and trained animals which gives performances typically in a large tent, in a series of different places”. From chariot races in Ancient Rome arenas to Barnum and Chipperfield, the perennial appeal of death-defying circus acts has evolved into spectacular contemporary entertainment: Le Grand Cirque Fantazie, La Clique, Cirque du Soleil. LIMBO sold out its premiere season at the Adelaide Fringe Festival 2013, (Pick of the Fringe Award), travelling on to the London Wonderground Festival and has now arrived at Edinburgh’s Winter Wonderland. (22 November 2013 – 4 January 2014). 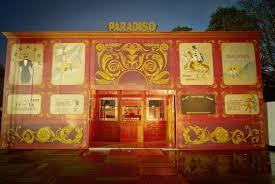 The Circus is back in town at the 1920s Paradiso Spiegeltent, St. Andrew’s Square, Edinburgh. Step into Limboland to witness an extravaganza of funky music, exotic cabaret, acrobatics, mime and magical illusion. The international ensemble combine traditional circus skills and musical talents from the US, Russia, Australia, Canada and France. In the dimly lit, intimate theatre space of the vintage Spiegeltent, let’s get the party started with the suitably soulful music of Sxip Shirey’s brass band: an eclectic tuba-rocking blend of New Orleans jazz, hip hop, blues and a hint of John Cage, described as Jank. Think Tiger Lillies with swagger and swing and you’ll get the picture. 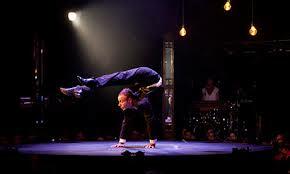 The show is in essence a series of variety acts – acrobatics, aerial trapeze, comedy, dance, music and song. First a performance of sheer physical agility: Jonathan Nosan bends his body as if made of rubber, creating mind blowing positions a professional yogi would be unable to achieve. Danik Abishev began learning his hand balancing act from the age of four in his Russian family’s circus. With perfect poise, he jumps from pole to pole upside down on his hands, requiring exceptional muscular strength. New York artiste, Heather Holliday was the youngest female sword swallower in the world when she trained at Coney Island Circus. Watching her (tentatively through my fingers!) put a flaming torch into her mouth, almost licking the fire, was breathtaking. Swallowing a sword was unbelievable – was it a trick with a retractable blade.? Presumably it was for real. Frenchman Mikael Bres has mastered the Chinese pole, clambering up like a monkey and sliding down head first at speed. Extraordinary choreography next for a stunning acrobatic dance: three men harnessed to bending poles, swing back and forward in quick succession, missing each other by inches. This Cabaret-Circus of slick star turns moves on apace: a classic bowler hat & walking stick tap dance routine, comedic mime sketch and a terrifying act of Illusion which, I guarantee, will make you gasp. Despite the show’s title there is no narrative to dramatise the Limbo world between heaven and hell in a theatrical context. This is pure showmanship, burlesque glamour, dare devil bravado, linked by the energetic rhythm of crazy music from Ringmaster Sxip Shirey and his versatile Band. NB. Seating is around the stage in booths and rows: Ringside, Posh, Stalls, Cheap. Sitting at the back on my Cheap seat, sightlines were poor with a Spiegeltent pillar blocking the view = a cricked neck straining to see the stage! Reserve Ringside or Posh seats for the best close up experience. 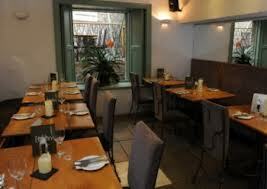 For a Christmas party night, book dinner and show in a private booth.